Scabies is a skin disorder that causes severe itching and irritation stemming from a mite that burrows into your skin and creates tunnels to lay eggs and hatch new mites. The presence of the mite and eggs causes an allergic reaction and itchy bumps in folds of your skin. One of the most important things to understand about scabies is that it is a highly contagious skin disorder. If you come into contact with others, such as the people you live with, they may become infected as well. If you believe you may be suffering from scabies or any type of chronic skin disorder, get help from a medical professional. If you do have scabies, you’ll need prescription medication to get better. If you prefer not to wait days or weeks for an appointment, find a FastMed Urgent Care clinic near you. At FastMed, we’ll get you in and out fast, so you can start feeling better as soon as possible. Avoid coming into contact with new people until your treatment is underway. Use the medicated topical cream prescribed to you by a medical professional. Repeat treatment with the medication if you notice any new rashes. Treat the lingering itching and irritation with over-the-counter remedies or by soaking in cool water. Ask your medical professional about taking antihistamines, which can lessen the allergic skin reaction and ease irritation. Wash all fabric items you’ve come into contact with in hot water with soap. Dry clean non-washable items or seal them in a plastic bag for two weeks to kill the mites. Avoid scratching your skin, which can cause bleeding and infection. It’s easy to confuse scabies with other skin disorders, such as eczema. 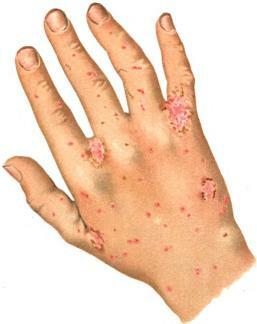 A medical professional can properly diagnose scabies with a simple exam and skin test. Visit a FastMed clinic for help with any type of skin disorder or other non-life-threatening illness or injury. We provide urgent care right in your neighborhood.